Popular Nollywood actor and former President of Actors Guild of Nigeria (AGN), Emeka Ike has taken to his Instagram page to show to the world that he has probably found love again. 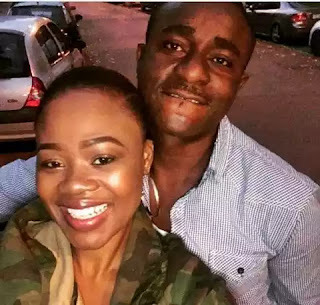 The handsome movie star who divorced his estranged wife, Suzanne Emma Rero few months ago on allegations of domestic violence, has reportedly found love in the arms of 28-year-old South African lady. The lovebirds have been seen together a couple of times, however, the name of beautiful and bootylicious sweetheart has not been revealed. It was also gathered that, the lovers stepped out for an award ceremony in Frankfurt, Germany. It’s obvious she went there to support him.